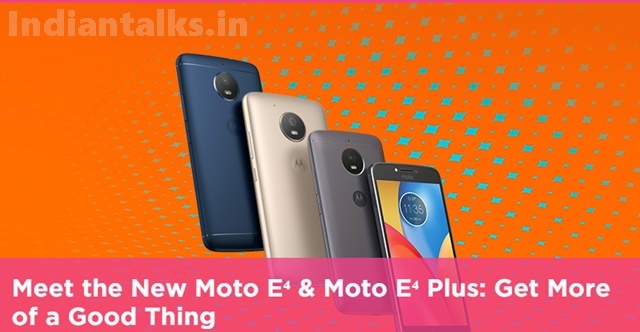 The Motorola has launched its budget smartphones – the Moto E4 and Moto E4 Plus – the successors of Moto E3. The Both handsets are metal-clad and rich in feature for their price.Both these have a metal body, have a fingerprint sensor and run Android 7.1 (Nougat). The Moto E4 has a 5-inch HD display and is powered by a quad-core Snapdragon 425 Mobile Platform or MediaTek MT6737 SoC, while the Moto E4 Plus comes with a 5.5-inch HD display, is powered by a Snapdragon 427 Mobile Platform or MediaTek MT6737 SoC and packs a 5000mAh battery along with fast charging support using 10W rapid charger. The Moto E4 comes in Iron Grey, Oxford Blue, Licorice Black and Fine Gold colors and is priced at US$129.99 (Rs. 8380 approx.) / €149 and will be Amazon Prime Exclusive Phone. There is also a Verizon version. The Moto E4 Plus comes in Oxford Blue, Iron Gray, and Blush Gold colors and starts at US$179.99 (Rs. 11,605 approx.) / €199. No word on the roll out details yet.